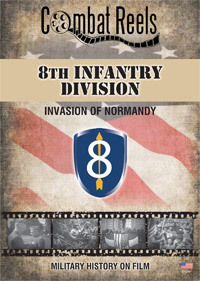 This is a DVD of the 8th Infantry Division, also known as the 'Pathfinders', a follow up division used in the invasion of France in late June. The division would land in the Utah Beach sector, and quickly move to support the actions of the VIII Corps attack towards Periers. This Invasion of Normandy film shows the actions of the men of the 8th Infantry Division as recorded by the 165th and 166th Signal Photo Companies, during the historic operation of the Normandy landings that started on D-Day, 6 June 1944. Combat Reels has researched and compiled all of this raw combat film footage, then reformatted it into the DVD format for your viewing pleasure. The military history footage in this video is intended to be strictly that of the 8th Infantry Division and only shows other unit footage when two or more units are intertwined. This video contains footage covering the time from May 1944, when the division was still in Ireland, to August 1944 when the 8th Division takes part in the exploitation of the breakout from Operation Cobra. Originally released on 11/01/2006, this DVD has been remastered with new additional research and re-released on 2/7/2014.